Geosynthetic Clay Liner (GCL) – Fabrimetrics Philippines Inc.
Fabrimetrics Geosynthetic Clay Liner or (FabriGCL) is a type of geosynthetic that is specially used for water proofing of man-made lakes, landfill yards, underground garages, building roof gardens, water tanks, oil depots, and chemical pile yards. GCL is a mat shape fabric that is produced by filling sodium based, high expansion bentofab bentonite, between special compound geofabric and non-woven geotextile. 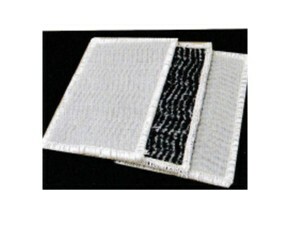 This locks the bentonite on the compound fabric through upper non-woven geotextile fabric by special needle punched method that forms many small fiber spaces, which prevent bentonite particles from moving in any direction. Thus, a rubber head water layer with uniform high density is formed in the liner when touched by water so as to prevent water seepage effectively. Bentonite composed predominantly (>70%) of montmorillonite or other expansive clays, are preferred and most commonly used in GCLs. A general GCL construction would consist of two layers of geosynthetics stitched together enclosing a layer of processed sodium bentonite. Due to environmental laws, any seepage from landfills must be collected and properly disposed of, otherwise contamination of the surrounding ground water could cause major environmental and/or ecological problems. Typically, woven and/or non-woven textile geosynthetics are used, however polyethylene or geomembrane layers or geogrid geotextiles materials have also been incorporated into the design or in place of a textile layer to increase strength. 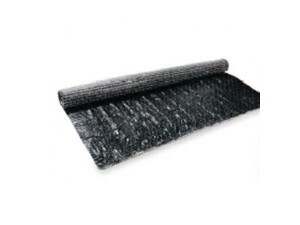 FabriGCL is constructed with the top layer made of thin HDPE membrane, the middle layer with bentofab bentonite sandwiched in between non woven fabrics, and the bottom layer with woven fabric. This fixes the bentofab bentonite between high strength geotextiles. Man-made lakes, fishponds, landfill, underground garage, roof garden, pool, oil depot,and chemical yard.